The Ireland-Palestine Solidarity Campaign is honoured to be hosting a meeting featuring an eyewitness account of the Israeli destruction in Gaza, and to the heroic resistance and steadfastness of the Palestinian people in its aftermath. 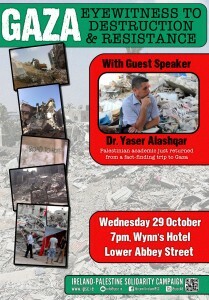 The meeting will take place on Wednesday 29th October, at 7pm in Wynn’s Hotel, Lower Abbey Street, Dublin 1. All are welcome to attend. Palestinian academic Dr. Yaser Alashqar went home to Gaza as soon as the Israeli slaughter there ended, and collected eyewitness reports from people on the ground, as well as himself bearing witness to the devastation wrought upon the population of 1.8 million people. In this meeting he will present images and testimony to the brutality of the onslaught. Dr. Alashqar will also speak about ways in which Palestinians are continuing to resist Israeli occupation, apartheid and colonisation, and how international civil society can help achieve justice and lasting peace in the region. The recent Israeli attack, called Operation Protective Edge, killed over 2,000 Palestinians and injured thousands more. According to the latest UN report, of those killed, 69% were civilians including 495 children and 253 women. It is estimated that €8b will be needed to rebuild the infrastructure in Gaza following the six weeks or relentless bombing and shelling by Israeli occupation forces. This includes the many schools, hospitals and water and power plants that were destroyed or severely damaged. Yaser Alashqar is a Palestinian academic from Gaza residing in Ireland. His expertise includes conflict issues, human rights, Gaza and Israeli-Palestinian politics. He has taught courses in these areas at the Marino Institute of Education and Trinity College Dublin, and has also worked with various NGOs in Ireland and Britain.